I've been eyeing this one for quite some time. Finally bought one. Hoi memang kaw... Drinking just one sip got me feeling really guilty already. Let's see if it really keep my eyes wide open. Haha. Update: Yes, it definitely keep my eyes open... WIDE OPEN! sya expect rasa dia creamy taw, because macam dia highlight the word "latte" tu. 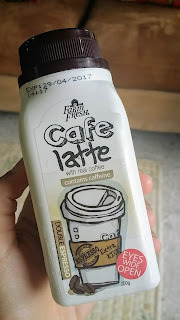 plus, farm fresh kan pengeluar susu, so sya bayang kan rasa susu freshhh bersatu padu dengan rasa kopi..